Yes, it is true. I have been crazy busy. But it looks like things are finally started to taper off a bit, so hopefully I can get back on track bringing you guys reviews. God knows Daniel has been working his little Canadian Tail off trying to fill my spots. Thanks bro! This week’s review is one I have been dying to get to. The wind is kicking out at 40 – 50mph so I am sticking with a smaller vitola and lighting up this San Cristobal Del La Habana El Principe. I can’t really find too much on this cigar. It’s Cuban, it’s small, its good. Does that suffice? Not really. 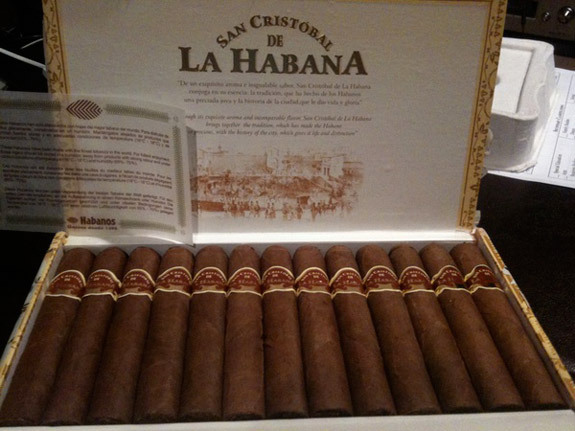 San Cristobal de la Habana is one of the newest cigar creating Cuban cigar companies to hit the market. 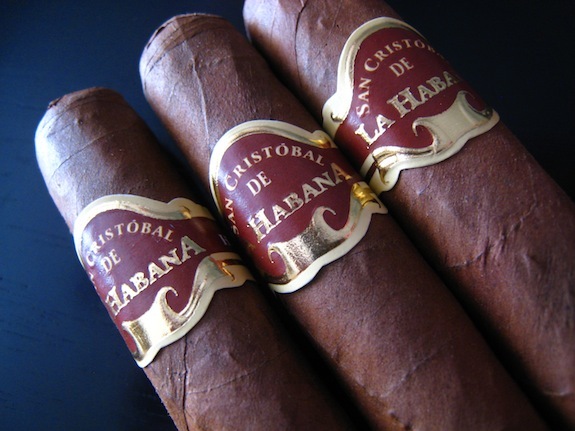 Created in 1999 San Cristobal de la Habana named itself after the original name for the capital city Havana and celebrate’s the city’s long history going into the new millenium. 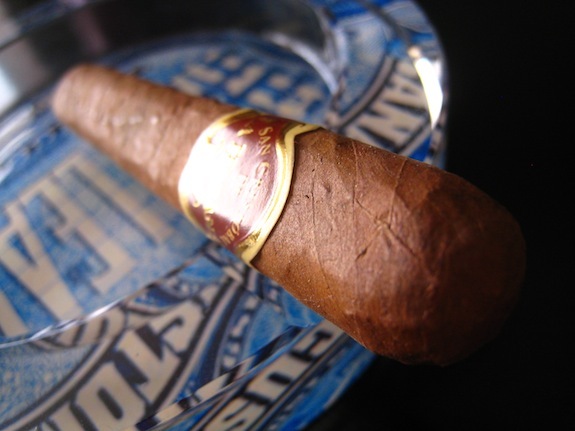 Prelight: The San Cristobal de la Habana is a short little stubby, box-pressed, style cigar. 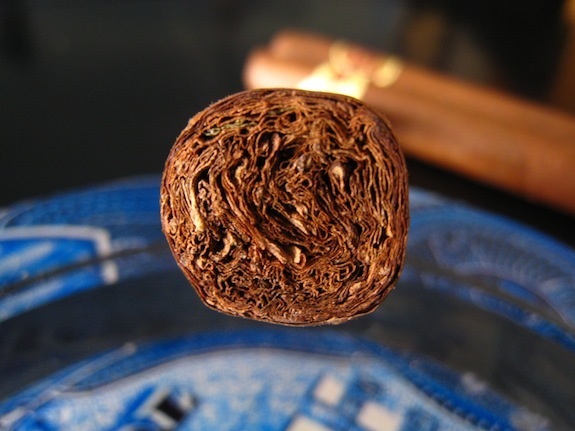 The wrapper is in tradition Cuban leaf styling, thing an delicate with a consistent milky brown colored wrapper. 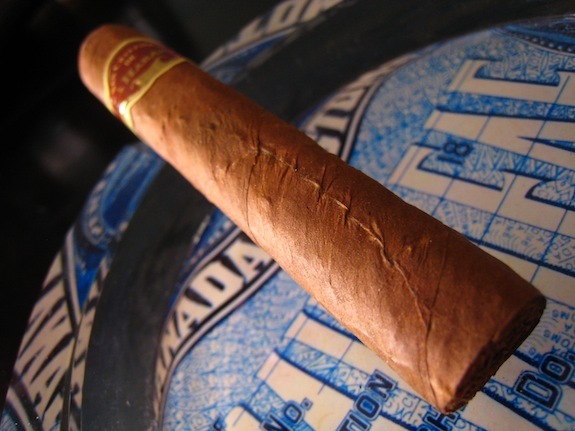 The body of this cigar carries a ton of little veins accompanied by one larger one stretching the length of the body. It’s very rare that I smoke a Cuban cigar that doesn’t have crazy veins, so I don’t think I will run into any issues with the burn. At least I hope not. The cigar is extreme firm to the touch, but due to the nature of the Cuban wrapper I don’t want to put too much pressure on this cigar for fear of cracking. The band is a very simple maroon based design sporting an off white, and embossed gold accents with the title “San Cristobal de la Habana” in gold, and “Cuba” and “Habana” printed in white on the back. 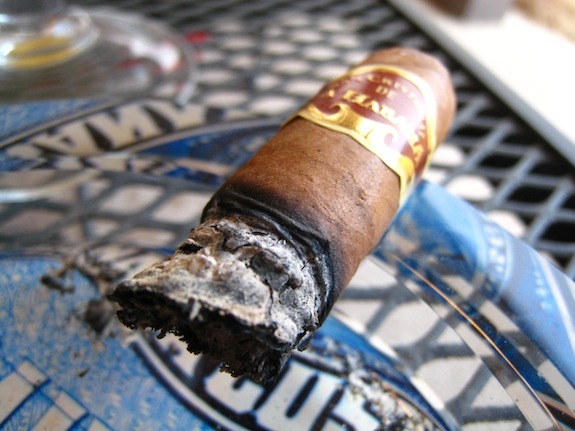 The wrapper of The San Cristobal de la Habana gives off nothing more than a faint grassy type aroma only to be more pronounced by the foot of the cigar. The cigar clipped cleanly, and evenly using my double bladed Palio cutter. The cigar gives off an overwhelming earthy taste from the cold draw as well as the famous salty flavors taken from the wrapper that I stumble across on just about every Cuban cigar. First Smoke: The San Cristobal de la Habana starts off with tons of salt being transferred to my lips via contact with the cigar’s wrapper. Once you can sort through the salt you can pick up just small hints of black pepper paired with lots of woodsy, sweet tobacco with nice, welcoming earthy undertones. The draw has a little withholding, but nothing too bad, and it kicks out a very hefty little cloud of almost brown smoke. The cigar gives off little to no stationary smoke. Which is neat, but kind of disturbing. I hope this isn’t cause for the cigar to go out on me. The burnline is very thick but remains very even for the most part. One neat not on this cigar is the burn is very slow. Usually I smoke straight through Cuban tobacco, but this one really extends itself. The ash left behind is a rugged, light grey with quite a few darker spots. It held tightly for about an inch before giving way. 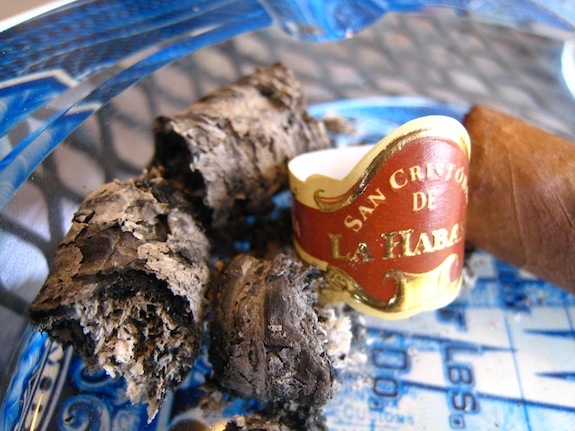 Halfway There: I am really enjoying the flavor change up in the San Cristobal de la Habana. What started out to be a salt and pepper (not to be confused with Salt an Peppa) mash up has transformed to a very sweet, sharp, woodsy flavor blend with hints of fruit. The draw has really seemed to open up into the second third as well. The retrohale is wonderful coating my nasal passage with a very sweet cedar flavor/aroma. 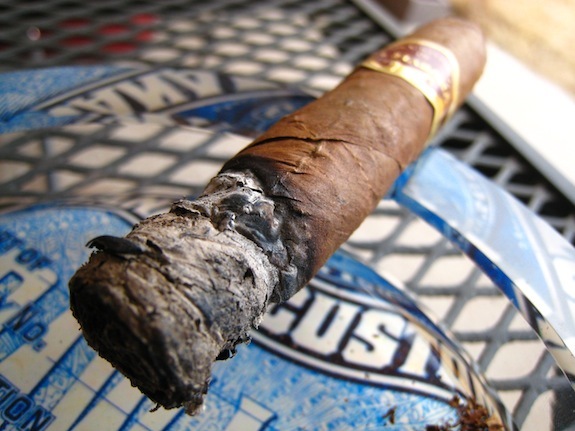 The body of the cigar isn’t much higher and medium/full which is perfect at this point. Anymore could cause you to really lose sight of the wonderful flavors that this cigar has to offer. The burnline is a little crazy on one half of the cigar, but I haven’t had to really touch up, or relight this cigar yet. Finish: As if the second third flavor changes weren’t already enough the San Cristobal de la Habana decided to throw in a bit of clove and even some faint vanilla flavors into the already flavor-packed mix. This cigar really keeps the smoker on their toes. The cigar seems to be burning much faster at this point. I guess the slower burn and even tightness of the draw at the beginning of the experience could be due to a tightly packed foot. The burn finished off relatively even with only a few smaller waves despite the crazy second third burn. I really didn’t feel any nicotine off of this cigar at all, and quite frankly, I wouldn’t have it any other ways. I really enjoy stronger, full bodied cigars, but some blends just aren’t made for that. 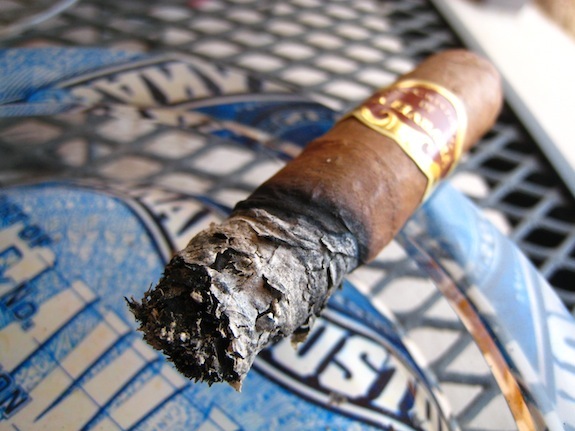 The San Cristobal de la Habana is a perfect example. Overview: This, in my mind, is the classic example of what a decent priced Cuban cigar should be like. The price point is well respected for the quality smoke this cigar delivers. True, it’s a little high, but I personally think it’s spot on and this cigar really deserves a high spot in my normal Cuban rotation. The mild, and smooth experience paired with the flavor explosion the San Cristobal de la Habana lets forth is ideal for anyone. If you haven’t had a Cuban before, this is a perfect starting point. Pairing: As I stated in my previous post (probably too far back for anyone to remember), my gout is gone! So I am back on the brew train! 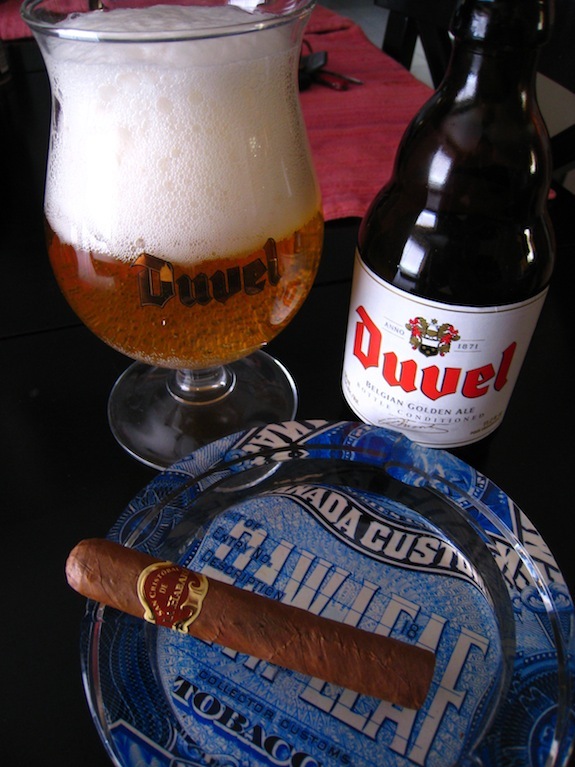 Pairing this week’s review with some simple, yet awsome Duvel. My little brother actually brought a pack of these over the other day under the supervision of my older brother (who may be making a guest apperance on this blog in the near future). They simple just “looked for Belgian beer”. They know me well. Duvel is a Belgian Strong Ale brewed at Brouwerij Duvel Moortgat NV in Belgium. It’s a simple ale, with a powerful 8.5% ABV. Tread lightly with these bad boys as too many can make you loopy. Duvel poured kicks out this very bright, almost pee-like yellow color. The flavors pushed through the brew are a spicy, zesty, citrus with hints of honey and hops. It sure doesn’t taste like a strong beer, but don’t let that fool you. It really packs a punch. This beer paired wonderfully with the Flavor packed San Cristobal without overpowering the mildness of the cigar. It’s actually a perfect beer to pair with almost any cigar. Nicely done bud! These are a damn fine short smoke, very tasty! I did have draw problems on a couple of them, but like you they seem to go away after an inch or so. Thanks dude! Yeah the draw issue didn’t bother me at all. It was slightly noticable. Thanks for covering for me! Chains removed! Welcome back,,,, I am so glad to not have to read that drivel big D puts down…. Hahahahahha…. Sounds like a good cigar. You need my address to get rid of those? Nice review as always. Thanks Tad! Glad to be back. I love these little guys. I was just tinking abotu getting a box. This sounds like a cigar that I need to try. I’m always curious to dabble a little further into the realm of “contraband”, but I’m always afraid I’ll come across a real turd cigar. From the sound of your review, this is a winner with a lot of flavor & complexity but not so many of the construction and burn issues. Good job as always. Time to go look for some for myself.